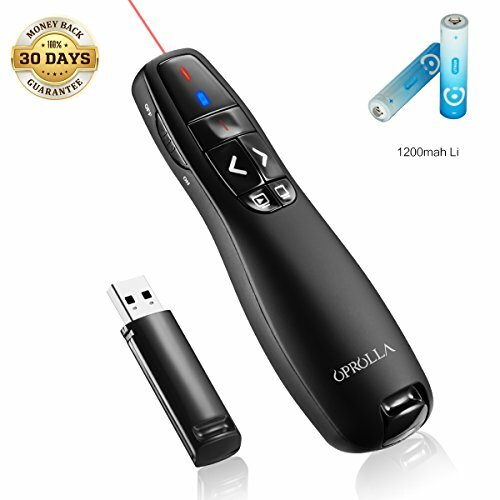 RF2.4GHZ powerpoint clicker-OPROLLA,Support hyperlink, a plug-and-play wireless receiver,simply plug into your computer's USB port for using, there's no software to install. Braille silent buttons are easy to find the function key by touch. Let your students focus on your lessons without distraction. The receiver can be stored in PPT presenter after finishing your lesson. It's mini portable and convenient,Best choice for teaching. Notice: Pointers powerpoint should not be directed at people or animals, please use it properly. OPROLLA is a registered trademark, which has been filed at the American chamber of commerce. 1.Question:Would the wireless presenter be used for powerpoint demonstrations? Answer: Yes. I have used presentation clicker with PowerPoint presentations on both Mac and Windows. I have also used clicker powerpoint with Prezi presentations on Windows. 2.Question: Does clicker presentation usb have storage for powerpoints? Answer: No ,PPT pointer clicker USB is the receiver for the unit and plugs into a USB port to connect the pointer to the computer wirelessly. If you have any questions about this product by OPROLLA, contact us by completing and submitting the form below. If you are looking for a specif part number, please include it with your message.